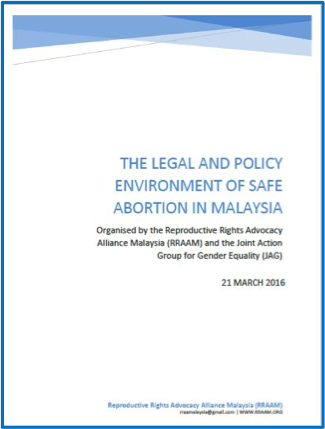 On the 21 March 2016, Reproductive Rights Advocacy Alliance Malaysia (RRAAM) in collaboration with the Joint Action Group for Gender Equality (JAG) held a policy discussion on “The Legal and Policy Environment of Safe Abortion in Malaysia”. The discussion was attended by the various stakeholders including the government sector, namely from the Ministry of Health and Attorney General Chambers, representatives from the Malaysian Medical Association (MMA) and Obstetrical and Gynaecological Society Malaysia (OGSM), international participants, health advocates, UNFPA Malaysia Country office, JAG and RRAAM representatives. The discussions were gathered in the report you can download here.